From Swans Buckerfields Brewery in Victoria BC comes their “Pumpkin Ale”. This beer has the aroma of Cinnamon, nutmeg, pumpkin and malts. The flavour of this beer is similar with Cinnamon, nutmeg, spices, malts and a light hops bitterness to finish it all off. This beer comes in at an alcohol content of 5%. 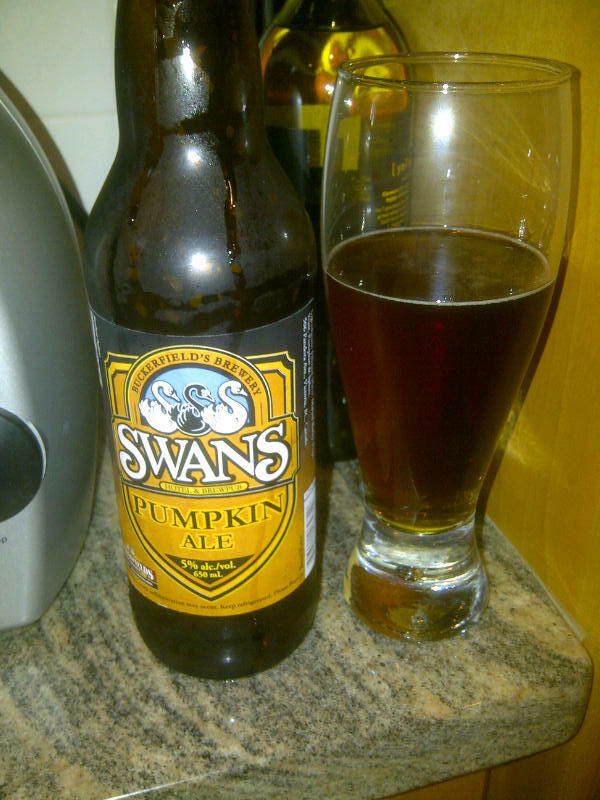 Not the best beer I have had of swans but a very good pumpkin beer still. This entry was posted in Ale, Pumpkin Beer and tagged bc, bitter, bitterness, canada, cinnamon, fall, hops, hopy, nutmeg, pumpkin, seasonal, spices, victoria.